I recently had the privilege of working with Bosheree Family Signs. Who is Bosheree Family Signs you ask? Bosheree Signs is a husband and wife team that creates Personalized Family Name Signs. They are a family owned online business that specializes in creating Solid Wood Family Name Signs. They hand paint each board and then paint on the letters using computer generated stencils. 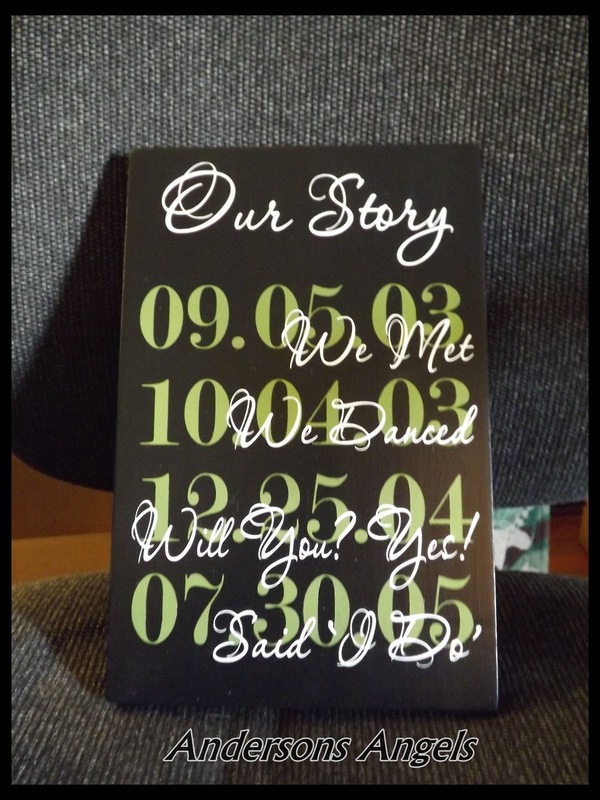 They love creating these beautiful keepsakes and that make great wedding, birthday & anniversary gifts!! I had my sign made with Jake and I's story. 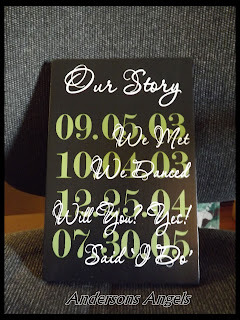 Seeing as we have been together for almost ten years a few of the dates were not the easiest to remember but thanks to calendars I was able to get the correct dates. Our Story: Jake and I met on 9/5/03 and did not see each other again until 10/4/03 at the homecoming dance. We have been together since the dance. Jake proposed to me on 12/25/04 and obviously I said YES and we were married on 7/30/05! 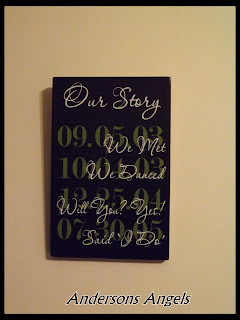 I have Our Story sign hanging in our bedroom beside our bed. I love the detail on this sign! I love the detail and time they put into each sign that they make. I would love to have one of these signs made for each of my children with their birth information on it to hang in their rooms. Bosheree has so many different wonderful signs you can choose from and if you don't see exactly what you are looking for then contact them to see about having something specially made. You can visit Bosheree on Facebook and Etsy to see their wonderful work!